Oreo truffles with lots of peanut butter flavor! If you like Oreos and peanut butter – this is the right recipe for you! 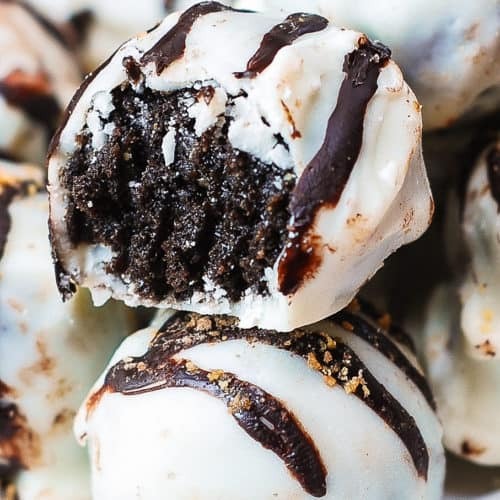 These truffles are made from crushed Oreos (with peanut butter creme filling) and crushed Butterfinger candy mixed in with softened cream cheese. Then, the Oreo truffles are coated in white chocolate (you can also use white almond bark). Delicious little Oreo balls that are easy to make at home, and are very popular with kids and adults alike! I’ve wanted to make Oreo truffles for a long time, and this was my very first try. The truffles turned out quite well: they looked gorgeous, did not fall apart, the almond bark coating process went smoothly. You can also use white chocolate to coat the truffles. 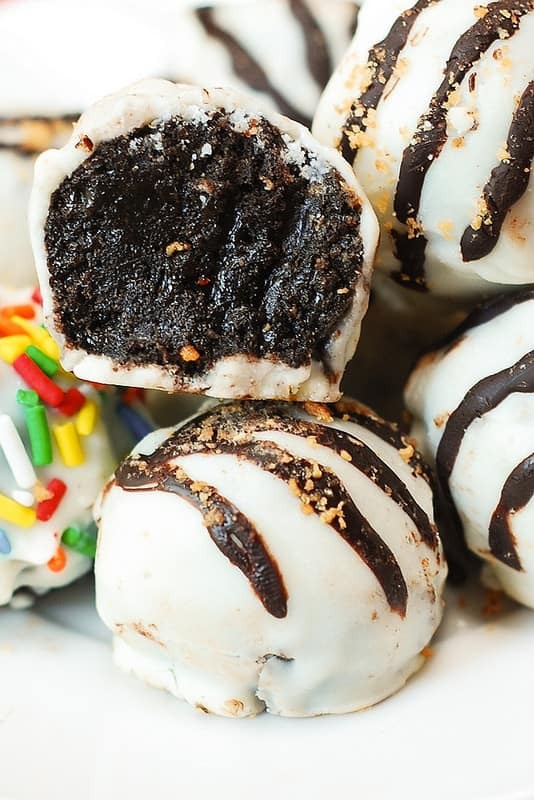 Which just shows how easy it is to make these cake balls. First, grind the Oreos and then Butterfinger candy and mix it all in with softened cream cheese. This is the easiest part of the recipe. 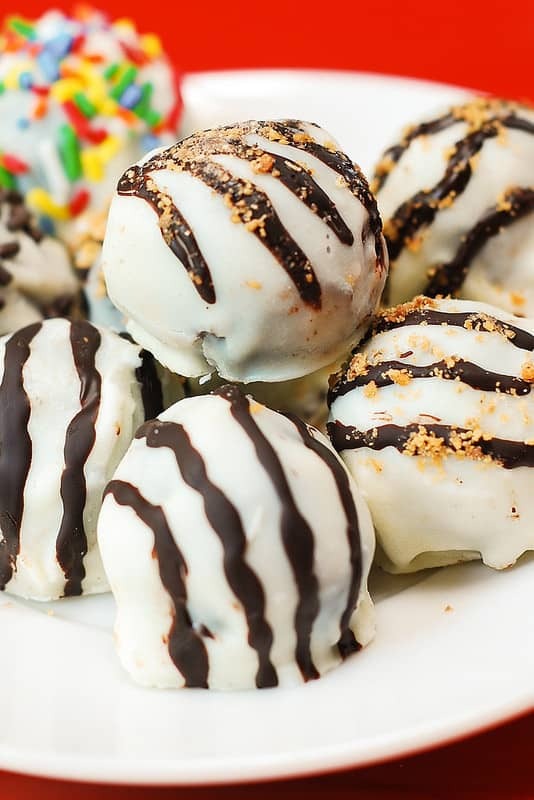 The more challenging portion is dipping the Oreo balls in melted white chocolate (or almond bark) to create a beautiful coating. To ensure easy coating process, I definitely recommend using the easy-to-handle almond bark baking bar that can be easily found at Walmart. It melts well, doesn’t seize as easily as regular white chocolate, and it stays nice and melty while you’re coating the truffles. After having dipped the Oreo truffles in the almond bark, refrigerate them for at least 1 hour to allow the white coating to solidify. If you like, while the coating is still soft, sprinkle Oreo truffles with colorful or chocolate sprinkles. Or, just leave truffles white. After refrigerating Oreo truffles for an hour (so that the almond bark coating solidifies), you can melt some regular dark chocolate chips and use melted dark chocolate chips to create decorative swirls over Oreo truffles. You can also sprinkle ground Butterfinger candy on top of the dark chocolate swirls (as on my photos). Slutty Brownies – 3 types of favorite sweets combined in one tall dessert bar: brownies + oreos + blondies. No Bake Oreo Dessert – filled with decadent layers of chocolate pudding and sweetened cream cheese and topped with Cool Whip and crushed Oreos. No Bake Chocolate Pudding Cream Pie with Oreo Crust – it’s easy to make using premade Oreo crust, Cool Whip, chocolate pudding and half-n-half. Oreo Chocolate Chip Cookies – super buttery and chewy. Oreo truffles made from crushed Oreos (with peanut butter creme filling) and crushed Butterfinger candy mixed in with softened cream cheese. Then, the Oreo truffles are coated in white chocolate (you can also use white almond bark). Place oreos in the food processor and process until fine crumbs form. You might have to process oreos in several batches depending on your food processor. Pour oreo crumbs out of the food processor into a large mixing bowl. You might have some big chunks of oreo still left unprocessed - return them to the food processor and process some more. Then, grind 12 small-size butterfingers in a food processor until fine crumbs form. Do it in two batches, 6 small-size butterfingers in each batch. Pour the crumbs into the same mixing bowl with crushed oreos. Add softened cream cheese. Mix until dough-like mixture forms. Chill the dough in the freezer for 15 minutes before rolling. Roll 1-inch balls and place them on wax paper lined sheet or tray. Because the balls can still be soft, they might flatten a bit - you will make them more perfect later. Place in the freezer for 15 minutes. Using a stovetop pan, microwave, or (the best choice) fondue pot, melt the Almond Bark Vanilla Baking Bar carefully (following instructions on the package), just as until it begins to soften. Do not overmelt, it should not be hot to the touch, just warm. Overmelting may cause it to seize. 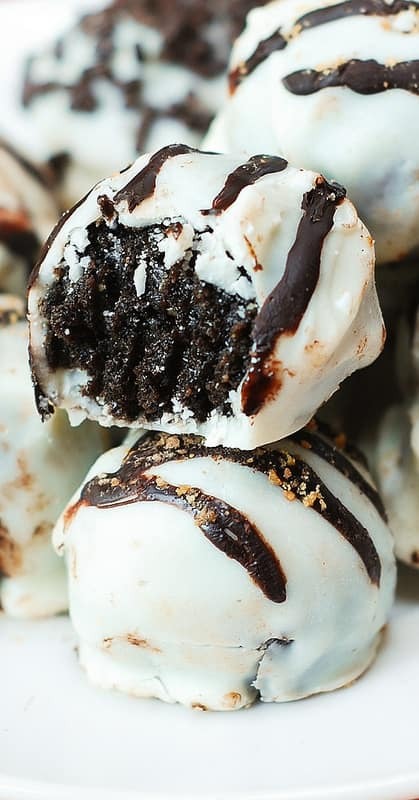 Taking several Oreo balls out of the freezer at a time (leave others in the freezer), and using a spoon, drop melted almond bark coating over each cake ball. Use spoons to move each Oreo truffle around a bit, if necessary, to get the coating evenly. Alternatively, you can also dip and roll each ball in melted almond bark, using slotted spoon, but do it pretty fast, to prevent the truffle from melting. Repeat with all remaining Oreo truffles. Place almond bark coated Oreo truffles in the refrigerator until the white coating solidifies, for about 1 hour. Optional: Before refrigerating the Oreo truffles, you can sprinkle them with colorful or chocolate sprinkles. Optional: After refrigerating the Oreo truffles for at least an hour, you can melt 1/4 cup regular chocolate chips, combined with about 1/2 teaspoon shortening, in a microwave (do no over melt, just do for a few seconds, until chocolate melts and is warm, not hot). Mix the melted chocolate well with a spoon - it will help it melt more. Make a piping bag by putting melted chocolate into a plastic storage (freezer) bag, securing it above the melted chocolate, and cutting a small corner tip off the bag. Then, squeeze the melted chocolate over the Oreo truffles as lines or swirls. Immediately, sprinkle with more crushed Butterfingers (crushed in food processor). Storage tips: These are best kept covered and refrigerated. These are just wonderful! Thanks for the recipe. Made the balls and put in the freezer for a short while. I just took out the whole pan and dipped. I didnt have a problem with them getting too soft to dip by standing out too long. I put them in the refrigerator after i rolled all of them and dipped them. Brought them to work with rave reviews. Great recipe. I already have made the mint ones with just the mint oreos and cream cheese. Now I have this delicious one as well. Thank You! 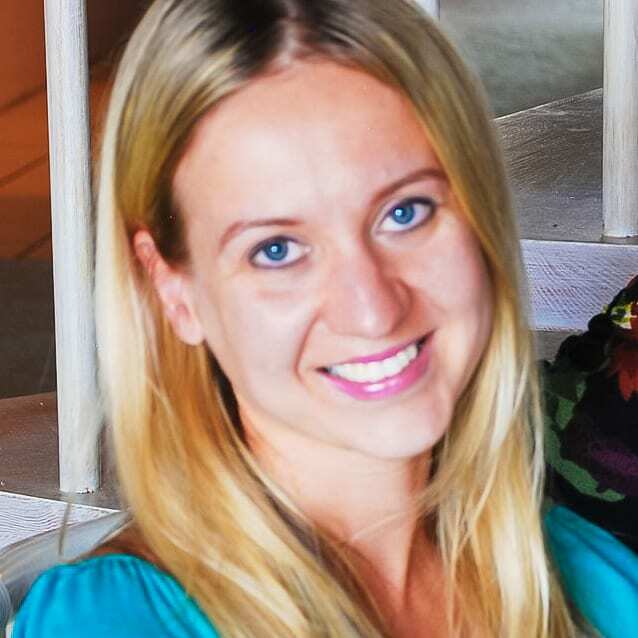 Amy, thanks so much for sharing! You got some great finds on your site!